With some kind of magnetic pull, ancient Egypt is a constant draw in museum shows worldwide. This year alone, a Cleopatra exhibit came to the Milwaukee Public Museum, A Pharoah exhibit came to the British Museum, and Egyptian art came to the Los Angeles County Museum of Art Even Egyptian fakes showed up at the Brooklyn Museum.Now an Egyptian double feature comes to the Museum of Fine Arts in St. Petersburg: “Forever in a Moment: Nineteenth-Century Photographs of Egypt,” through April 10, 2012 and “Ancient Egypt—Art and Magic: Treasures from the Fondation Gandur pour l’Art/Geneva,” opening December 17 through April 29. This isn’t even the first time that the Old Nile got featured at MFA. “The Lure of Egypt: Land of the Pharaohs Revisited'' was mounted back in 1998. 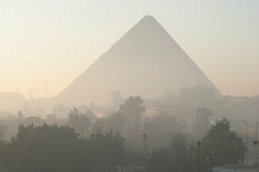 Our fascination with Egypt is as old as its pyramids and was already far along in the time that Moses saw it.